The Immortelle range is not new, in fact it has been part of L'Occitane's lineup since 2009, however it has recently been updated with a higher concentration of Immortelle Essential Oil, which has twice the anti-oxidant power of Vitamin E. In addition to updating the formula of its existing products, they have also added a Cleansing Balm and Cleansing Cream-In-Foam to the lineup. I was kindly sent the Cleansing Balm and have been using it for the past 4/5 weeks but I was hooked from the first use. 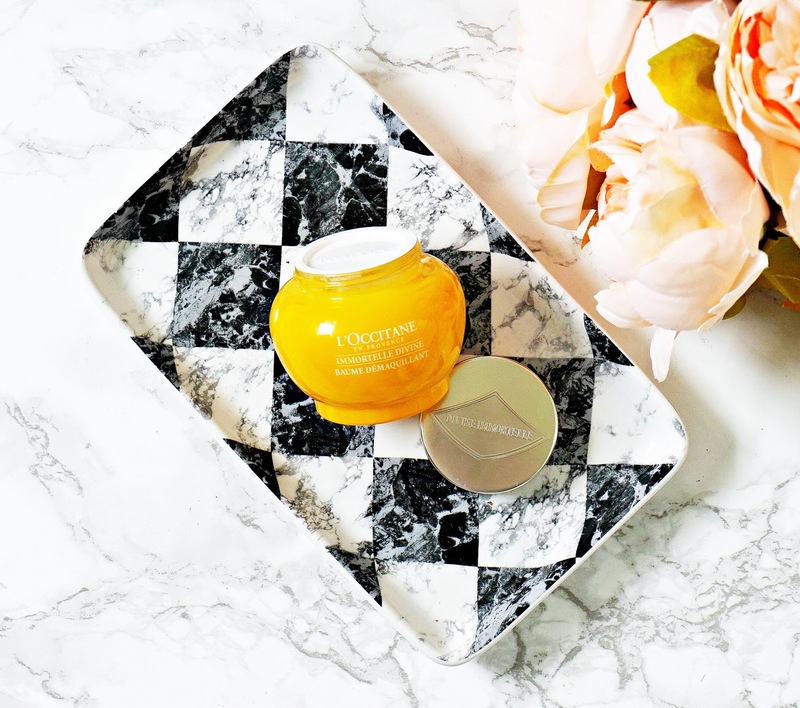 Housed in a heavy glass, aesthetically-pleasing pot, this balm has certainly brightened up my skincare lineup. The product itself has a rich, balmy consistency with a nice amount of slip and it melts when massaged into the skin before transforming into an oil. It is the perfect texture for dry skin or those who get dehydrated skin in winter because it thoroughly breaks down every last trace of makeup and cleanses the skin completely but without stripping it. It rinses easily and completely, leaving no residue. Skin is left feeling soft, nourished and thoroughly cleansed and looks glowing. This cleanser is a real treat to use and makes the cleansing ritual a pleasure. I would recommend it most for normal/dry/mature skin, however if you have oily or combination skin, you may want to try the cream in foam. The 64g pot is priced at €36.50. It has left me wanting to try more from this range, for sure! Have you tried this cleanser or anything else from this range? What is your preferred cleansing product? I'd love to hear! All products are bought by me, unless otherwise stated. This cleansing balm was kindly sent to me. Opinion is always my own.